I had a lot of fun designing customs with the C3V Inner Sanctum, and now that I am done, I've decided to continue out here with everyone. Since I really don't have any way to create a card on my computer without it looking pretty awful, I'll just be posting text versions of everything unless someone is kind and generous enough to make cards for me. I'd like to hear anything you have to say about any of my customs (though there's not much here yet). The figure used is a Pathfinder miniature from the Shattered Star release. The figure's name is Fire Giant. 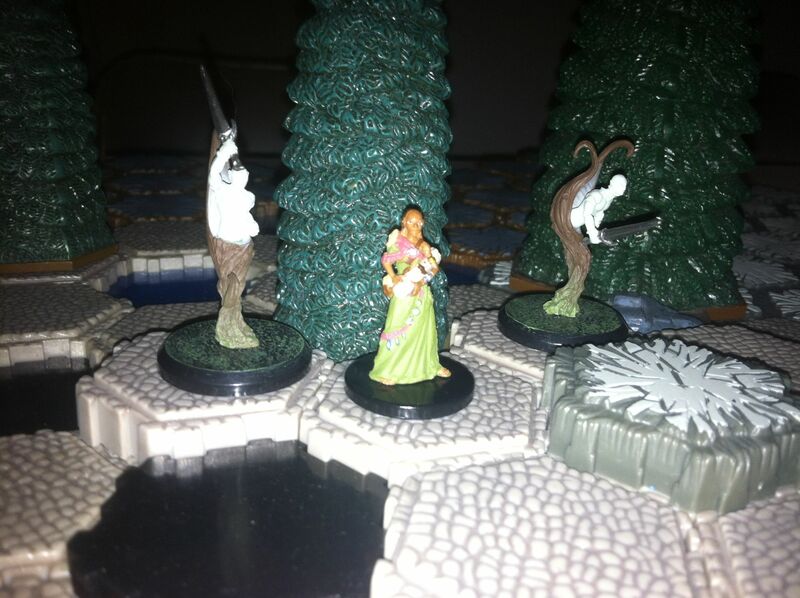 The figure used is a Pathfinder miniature from the Heroes and Monsters release. The figure's name is Human Druid. Lorthonel starts each game with up to 4 Evergreen Trees on her Army Card. If Lorthonel ends her turn on an empty land space, you may roll the 20-sided die. If you roll a 1-3, nothing happens. If you roll a 4-20, you may place an Evergreen Tree from her Army Card onto any space within 4 clear sight spaces of Lorthonel. The figure used is a Dungeons and Dragons miniature. The figure's name is Rockfire Dreadnought. Rakshasas starts the game with up to 3 molten lava tiles on his card. If Rakshasas destroys an opponent's small or medium figure with Lava Burst Special Attack, replace the destroyed figure with a molten lava tile, if possible. Figures with the Lava Resistant Special Power are not affected by Lava Burst Special Attack. All figures you control with the lava resistant special power add 1 to their move. Rakshasas never rolls for molten lava damage or lava field damage, and he does not have to stop in molten lava spaces. Last edited by vegietarian18; March 1st, 2015 at 05:28 PM. Re: vegie's customs- Fire Giant added! 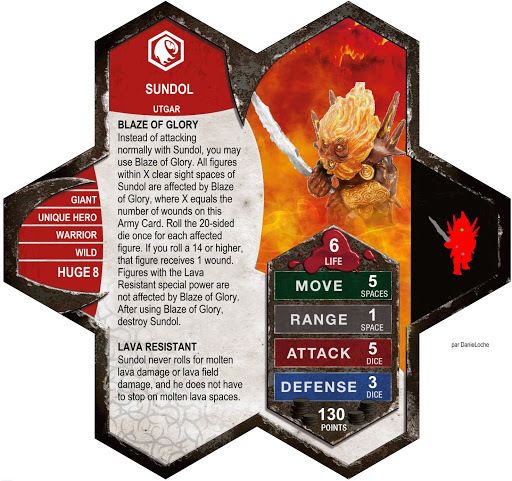 I like the concept, but you misname it in the text of "Blaze of Glory". Thanks for the catch. Renamed the figure earlier today after some opinions that a two pun card was too much, and forgot to update it. While I liked the pun, even Heroscape isn't that much of a joke. I think this guy could use a a third power. Lava Resistant is a given and even though Blaze of Glory is cool, it's not as effective as you'd think. A thought I just had was Overextend Attack. It lets him build up a Blaze if he's got 4 wounds and gives him a bit more hitting power. The Fire Giant is pretty cool. I love the pun, because it makes sense on so many levels. He's a better unique, IMO. The newer pathfinder figures are pretty rare and even the commons barely reach minimum availibility. Here's how I would play him. On the first round, I'd stack all my OMs on him and run to the opposing side, hitting things with my 5 attack. Once I'm about to die, I BLAZE OF GLORY in the opposing start zone, trying to kill everything around me. He seems to be priced accurately. Maybe a personality change or a class change is in order, but what you have seems fine to me. I don't think he needs a third power, unless you want to add a "simple" one. Very nice job overall. Is it just me or am I not getting this pun? I think Blaze of Glory is from the Bon Jovi song is that what it is? Maybe I'm just skimming over it. Cool custom Vegie too. Is it just me or am I not getting this pun? I think Blaze of Glory is from the Bon Jovi song is that what it is? Maybe I'm just skimming over it. When one dies in a "Blaze of Glory" he kills many enemy soldiers along with him. Patroclus from the Iliad is a great example (or Boromir in Lord of the Rings). The pun is because he's a fire giant and therefore causes a "blaze". Thanks Arch-vile, I thought it had to do with that but I wasn't sure what. Wait a second, Personality: Wild! I like the idea for the first power! Here is a card... made quickly because I can't find a good photo for the card to make something better! Last edited by DanieLoche; March 4th, 2013 at 06:27 AM. Reason: Link broken ? First off, thanks for the great-looking card DanieLoche. Looks fantastic. OP is updated with it now. Shark is definitely the right term. He draws a ton of fire with his big normal attack, and Blaze of Glory just adds to that. You want to take him down as fast as possible, so maybe he doesn't even get a chance to Blaze. That actually creates fun decisions for the Fire Giant player too; do you blow him up when he only has three wounds on the chance he dies next turn? Yeah, the pun is that he dies in a "blaze" of glory. I tried to make that clear by using 14 (roll for Searing Intensity) as the roll for it. My dad thought of the Bon Jovi song too when I told him about the power. Overextend is interesting. It would give him the ability to give himself wounds which is nice; but I actually think it might be a bit too powerful given that he'd be able to rush into the startzone AND juice himself up at the same time. With just overextend, he's got the same stats as Alastair. Blaze of Glory and Lava Resistant are probably worth more than 20 points. And, as the card shows, there's not much space to squeeze in a third power with how long Blaze of Glory is. I think I like him with just two powers now. Personality I want to leave as Wild. I think it works well. The class was just a placeholder really, same as the Frost Giant's, but I don't really know what works better. Perhaps Marauder? Oops, forgot the most important thing, Unique vs. Uncommon. I think Uncommon works better thematically, just to match the Frost Giant. We already have a unique fire giant in 'scape. Availability may shoot this down though; although I can't see anyone ever wanting more than one of this guy. Total: At least 50, and that's not counting ebay stores with just 1-3 that I decided to leave out. Plus, Shattered Star just came out, so some places may not have/can still order more. Auggie's hasn't even stocked it yet. Last edited by vegietarian18; March 2nd, 2013 at 06:21 PM. More text can easily fit in the Card because there the text is at his size maximum, but I think too that 2 powers are sufficient.